A low cost yet efficient all-in-one printer with a tradition design. Despite the cost, the printer offers great printouts. The photocopier and high-quality scanner make this printer a perfect fit for home office or small business users. Offers a very basic design without any touch screen panel. However, the printer has two paper tray; one at the back side for input and other at the front for printed out documents. Both of the paper trays can be folded in, to offer more space and convenient transportation. The printer weighs approx 7.9 lbs with a portable design and provides a wired connectivity. There are 2 cartridges slots for the HP Deskjet 1050 Ink. If you are looking for a high-quality budget-friendly all-in-one printer for your home office the budgeted HP Deskjet 1050 ink cartridges can be a suitable choice. However,the printer fails to offer hi-tech features, including, wireless connectivity, ePrint system, touch screen panel etc. The HP DESKJET 1050 printer is a multifunctional printer that facilitates printing, scanning, and copying. Though it proves to be a good low-budget addition to your workplace or home, you may experience many printing problems. Printing issues such as broken prints, low-quality prints, issues with paper feeding, bordered prints are often experienced. If the printer stops half-way while printing a document, then giving another print command will not help. You will notice the power light blinking. This indicates that due to some error the printer cannot print further. During such a situation, press the “Start Copy Color” or “Start Copy Black” button. This will reset the printer and you can print again. Remember that HP DESKJET 1050 ink cartridges that are compatible with the printer will always give you the best results. If the printer is still not working then try the next step. In your software application, go on to the File menu and select Print option. A dialogue box will appear. In case you have been using other devices through your system, the dialogue box will show the list of devices attached to it. Make sure HP DESKJET 1050 printer is selected. Select the Properties option in this dialogue box and select the Paper/Quality tab. A drop-down menu will appear. Click on the More option. Now select the type of paper from the list, for example, photo paper, plain paper etc. Make sure the paper that you select here is same as the one you have loaded in the printer. Click OK and try printing again. While using the printer many times, you would want to use papers of different qualities and sizes based on your requirements. Following the above steps will help you troubleshoot. While doing so also check if the HP DESKJET 1050 ink cartridges you are using have not yet exhausted. If so, get new ones and replace. Q. What if the HP DESKJET 1050 ink cartridges purchased from your website get damaged during transit? Will I be refunded in such a situation? A. Yes, we offer the refund if the items turn out to be damaged. In such a situation, the customer needs to contact us on 048 30833221 or email us at info@printerinkcartridges.ie . We will then arrange for a replacement or a refund for the cartridges and the postage incurred by the customer for returning them. Once the item has been returned to us and tested, we’ll place a refund in your account. Q. What are the dimensions and weight of the HP DESKJET 1050 printer? A. 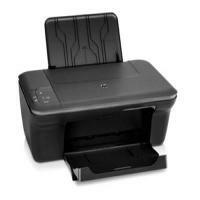 The dimensions of the HP DESKJET 1050 printer are:- 156 mm (Height) x 427 mm (Width) x 306 mm (Depth). Its weight is around 3.6 kg. Q. How can I check the estimated ink levels of HP DESKJET 1050 ink cartridges inside my printer? Click the HP All-in-One desktop icon to open the Printer Software. In the Printer Software, click Printer Actions and then click Maintenance Tasks to access the Printer Toolbox. Q. What is the use of single cartridge mode on the HP DESKJET 1050 printer? A. The single-cartridge mode helps to operate the HP DESKJET 1050 printer with only one print cartridge. The single-cartridge mode is initiated when an ink cartridge is discharged from the cartridge carriage of the printer. During single-cartridge mode, the product can only print from the computer. Q. I currently reside in Limerick. Can you deliver HP DESKJET 1050 ink cartridges here? Q. What sizes of media can the HP DESKJET 1050 printer print on? A. HP DESKJET 1050 can print on sizes such as 3.95 in x 5.9 in, 5.12 in x 7.1 in, A4 (8.25 in x 11.7 in), A5 (5.83 in x 8.25 in), A6 (4.13 in x 5.83 in) and B5 (6.93 in x 9.83 in). Q. Is the information provided on this site about the HP DESKJET 1050 ink cartridges is correct? A. Yes, the information provided is best to our knowledge. We have described each product as accurately as possible. If by our own mistake we have not priced an item correctly, we will notify you the correct price at the time of checkout. Despite of that if you find any variations in the product descriptions, contact our Customer Services on +44(0)28 308 33221 and we will clarify your query. Q. I am engaged in regular printing and planning to stock the HP DESKJET 1050 ink cartridges in bulk. Where can I check the availability of the product for bulk orders? A. We at Printer Ink Cartridges provide the facility to order the cartridges in bulk. To check, you can visit the product page and then check if the particular product is available for bulk purchase. If for any reason beyond our control we cannot supply a certain product we will not be liable except to make sure that you are not charged for that product. Q. Is the printer user-friendly in nature and can I install it without any help? A. The instructions written for installing the printer are written in an easy to understand way in the instruction manual and that one can easily install the printer without any outside help. The instructions are also available online in HP’s website. Q. HP is branded as one of the best in laptops, does the type of printers it supply also lead the market? A. Once purchased, the printers run hassle-free without giving any problem. The small errors or problems which may crop up can be easily rectified using the online guidance provided by the HP website. Q. What kind of damage can a compatible toner cartridge do to my printer? A. Compatible toner cartridges are made by qualified companies like Printer Ink Cartridges which have same specifications as the OEM one. A small possibility that might exists while ordering for the HP DESKJET 1050 ink cartridges is that it may leak the toner into the printer causing unwanted stray marks on the paper. Having the printer cleaned and replacing the toner cartridge will easily correct this. It is unlikely that a toner cartridge will damage the printer itself. Q. What is the input tray and output tray capacity of HP Deskjet 1050? A. The input and output tray capacity for the HP Deskjet 1050 printer is not very impressive as this printer can hold only a small amount of pages. The input tray capacity is 60 sheets whereas the output tray capacity is 25 sheets. Q. Can I use 300XL ink cartridges for my HP Deskjet 1050 printer? A. No, you cannot use 300XL ink cartridges for your printer. You must use only the HP 301 ink cartridges or the HP 301XL ink cartridges for your printer as these ink cartridges are specifically designed for this printer. No other ink cartridges can be used for your HP Deskjet 1050 printer. The HP 301 ink cartridges are of standard capacity whereas the HP 301XL ink cartridges are high capacity.These are the HP DESKJET 1050 ink cartridges that are used with this printer. Q. Do you stock multi-packs for the HP 301 ink cartridges or the HP 301XL ink cartridges? Or do I have to buy them separately? A. Yes, we do stock multi-packs for the HP 301 ink cartridges or the HP 301XL ink cartridges. E These multi-packs contain different number of ink cartridges and available at reasonable prices. You can choose the multi-packs available on the website and order them accordingly. Q. I have recently purchased a HP DESKJET 1050 printer. But it does not recognise the HP DESKJET 1050 ink cartridges. Could you please tell me the probable reason for this? A. The probable reason for this could be that the HP DESKJET 1050 ink cartridges are not installed properly. Please make sure that you are using the HP 301 ink cartridges or the HP 301XL ink cartridges. Also refer the printer manual of the printer for the instructions for replacement of the ink cartridges. Q. Do the ink cartridges for my HP Deskjet 1050 come as compatible as well as originals? A. The ink cartridges for your printer are available as both original and remanufactured. Remanufactured HP 301 ink cartridges are better value and offer excellent print reproduction. Q. How many colour inks are there my HP Deskjet 1050 ink cartridges? A. The HP Deskjet 1050 ink cartridges come in 2 colours; black and tri-colour. Q. What is the ink capacity of the HP 301XL compared to the HP 301? A. The HP 301 standard ink cartridge has the capacity to print approximately 190 pages black and 165 pages for the colour. The HP 301XL has the capacity to print approximately 480 pages black and 330 pages in colour. These calculations are based on 5% coverage of an A4 page. Q. Can I buy a refill kit to refill the HP301XL cartridges myself? A. We do not sell refill kits and recommend that you purchase either the remanufactured or genuine HP 301XL ink cartridges. Q. Will the ink cartridges from my now defunct HP 1050 printer work in any other HP printer? A. Yes, there are several other printers that will accept the HP 301 and HP 301XL ink cartridges, please contact our customer service department to obtain a full list. Q. Why are the remanufactured HP Deskjet 1050 ink cartridges cheaper than the originals and will they work as well? A. The remanufactured cartridges are less expensive than the original as they are pre-used HP301XL inks and have been returned to the factory, refilled, checked, refitted with parts if required, tested and repackaged. Q. My HP DESKJET 1050 printer turns off suddenly without warning. Though it is under warranty period, should I get it replaced? In this position, disconnect the power line from the back of the device. You need to unplug the cord from the wall outlet as well. Now connect the power cord to the outlet as well as the printer. Turn it on if it does not turn on on its own. Q. I have been experiencing poor print quality after I replace the old cartridges. Is this problem due to poor ink cartridge quality? Should I return it and buy another set? A. There might be times when you experience print quality related issues. There are chances that this may be linked to the ink cartridges. When you install a set of HP DESKJET 1050 ink cartridges and while doing so you touch the sensitive areas on the cartridge, it may affect the ink flow. Many other times while setting an HP DESKJET 1050 ink cartridge into the slot, you do not pay attention that it has been inserted properly. Once you insert the ink cartridge into the slot you need to click it in place. There is another reason of the bad print quality that you have been experiencing. This may not necessarily link to the HP DESKJET 1050 ink cartridges that you have recently installed in your system but rather due to clogged print head nozzles. When the print head nozzles get clogged it prevent the ink to flow properly and completely. You are required to perform a print test for the above and if the test pattern does not match the printed pattern then you are required to run nozzle cleaning cycles. Q. Please guide me how to replace the ink cartridges? Do I require the help of a trained person for the so? Turn on your machine and load the papers. Open the cartridge access door and wait for the carriage to move to the center. Gently lift the cartridge lid, press the tab to release the ink cartridges and remove these from the slot. Prepare the new HP DESKJET 1050 ink cartridges by removing the shipping tape. Remove the protective plastic tape carefully. Insert these ink cartridges into their respective slots. Close the cartridge lid. You need to align the newly replaced HP DESKJET 1050 ink cartridges by printing an alignment page first. You will have to scan this alignment page and follow the steps for alignment. Once the ink cartridges have been aligned your printer is ready to use. Take a test print to check if the ink cartridges have been installed properly and your printer is working.